How to draw face basic proportion. Learn to draw face basic proportion and construction from video tutorial. 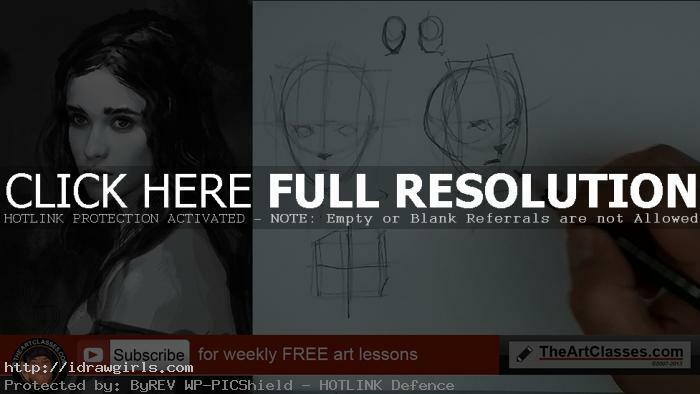 This video tutorial is an update as an additional tutorial face or basic structure of portrait. For more information, you can go to the older post here, How to draw face. I just updated the tutorial post. How to draw face. Learn to draw Face, How to lesson step by step realistic face online lesson. This tutorial will guide you through an easy to follow instruction on how to draw a face. We will be drawing eyes, nose, lips or mouth, eyebrows and all the facial construction. 1) I usually start with an egg shape drawing, very old school and traditional and it quick for me. On this one I am going to angle it a bit so the face will be 3/4 instead of the frontal shot. Always attach the neck and a bit of shoulder with the head when doing face, it gives you more of an illusion of this is part of a person. When you see an illusion of this is a part of a person, you will do a better job filling the rest in, instead of just an outline of egg shape or oval. 2) Imagine a flat plane on front surface of an egg, think in three dimension, then draw two vertical lines along the edge of your imaginary plane. After that, draw a vertical line to split the flat plane in half from top to bottom. Then draw a horizontal line to divide the top and bottom distance in half. This horizontal line would be where humans eyes should be, they are usually right in the middle of the face horizontally. But most of the time we don’t really see that because our hair deceives us. This step, I add two more horizontal line on top and bottom of the existing one. These line will help me indicate how tall should the eyes be in comparison to the rest of the face. Another mark for the bottom of her nose, it is half way in between the first horizontal line and the bottom of her chin. And again in between the nose mark and the bottom of the chin half way should be where her mouth is. 4) Now, I draw the eyes, it should no be taller than the distance of the top and bottom horizontal lines that I added on to the first horizontal. I draw the corner of both eyes in relation to the first eye’s indication line. Also the distance between the two eyes should equal one eye. So when you draw, imagine there is an invisible eye in between them. Then I begin to draw the nose, notice that I did not draw the whole nose. Why? Because in reality when you see the whole nose you tempt to draw the whole nose as you see. But if you paint a lot or draw a lot from life (especially in painting). You will notice, from squinting to find value in painting or rendering, that the value of the physical nose compare to the rest of the face is not at its darkest value to be able to put them in line drawing. If you were to draw a simple face which using black or darkest value to define the line drawing. The only part of the nose that should appear in line drawing should only be the bottom of the nose. Go watch How to draw nose for more detail. Because that’s where it casts the shadow as strong as a person eyes’ line, eyelashes, and lips. More drawing video tutorial you might be interested in.